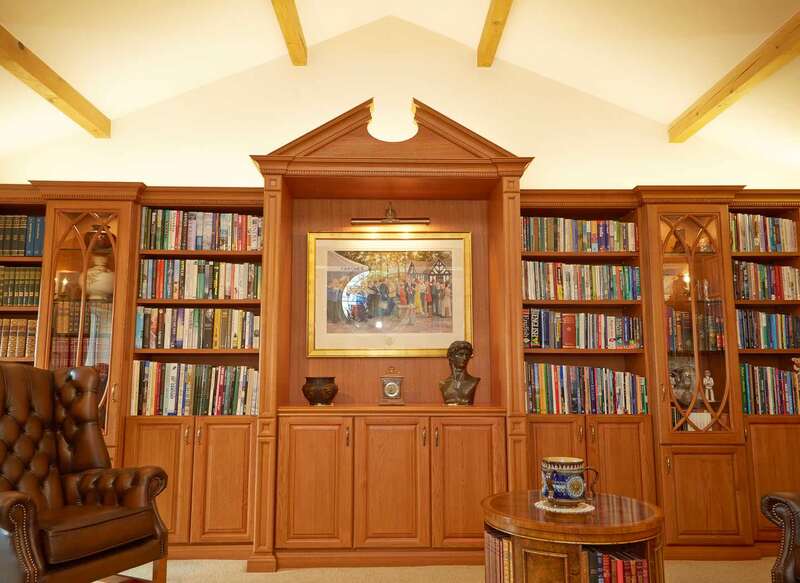 David Kaye, a retired company director, avid bibliophile and compulsive accumulator of archive material was housing over 2,000 books and 250 lever-archers in an assortment of budget bookcases. However, on his move to a beautiful 19th century cottage, he decided to create a purpose-built library for his collection. 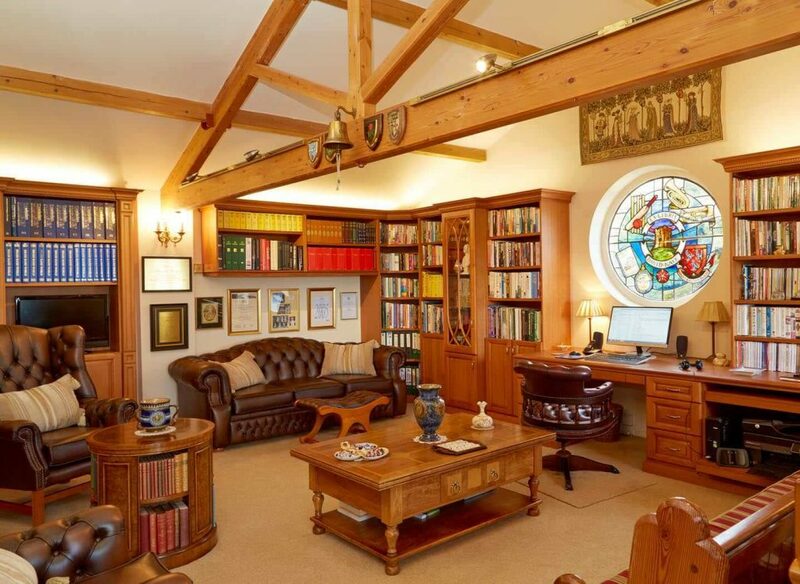 Although he required a desk for study, David requested that the library be built with attractive base cupboards to avoid an office atmosphere. 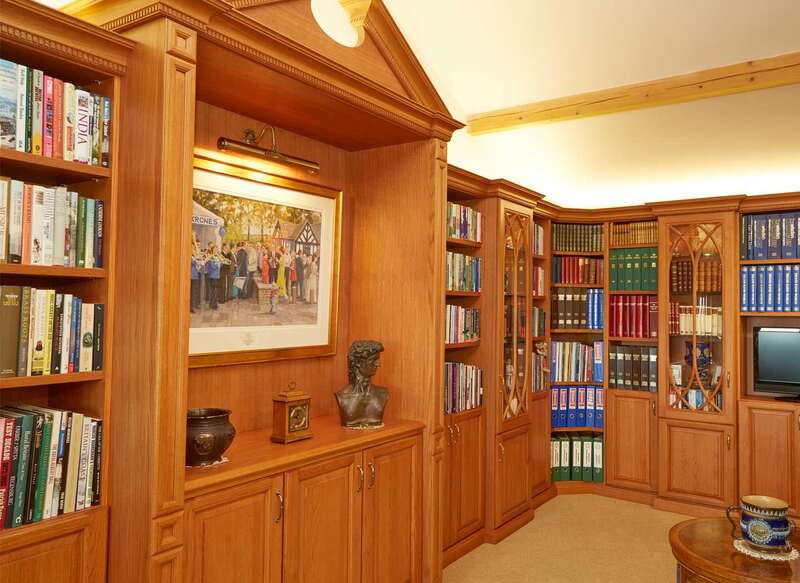 He also requested that Strachan design a space for his professional and sporting awards, as well as his cherished retirement commissioned painting, all in a style that complemented the unique character of his new home. Together we decided on the Shades of Oak collection in a Mellow finish. 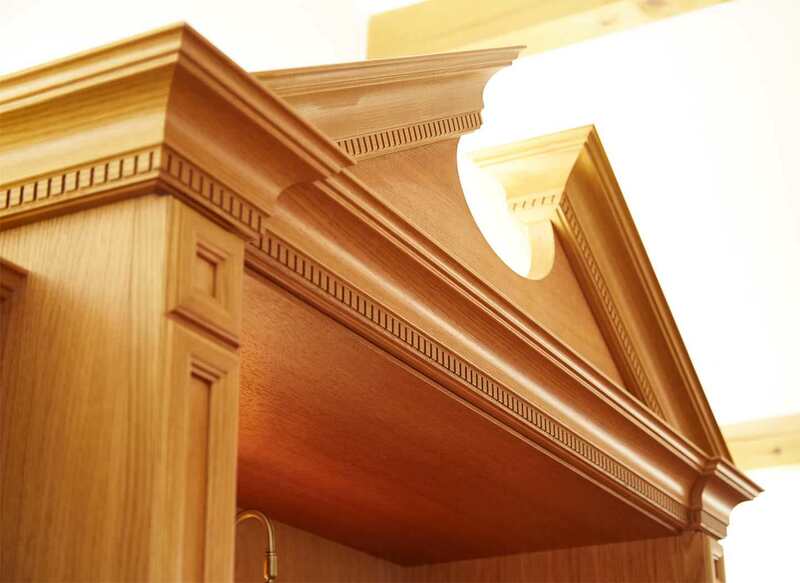 This allowed us to introduce delicate cornicing and elegant moulding into the design of his fitted furniture. This precise detailing lent itself beautifully to his traditionally styled interiors, and helped his new bespoke collection to effortlessly blend in with his home. 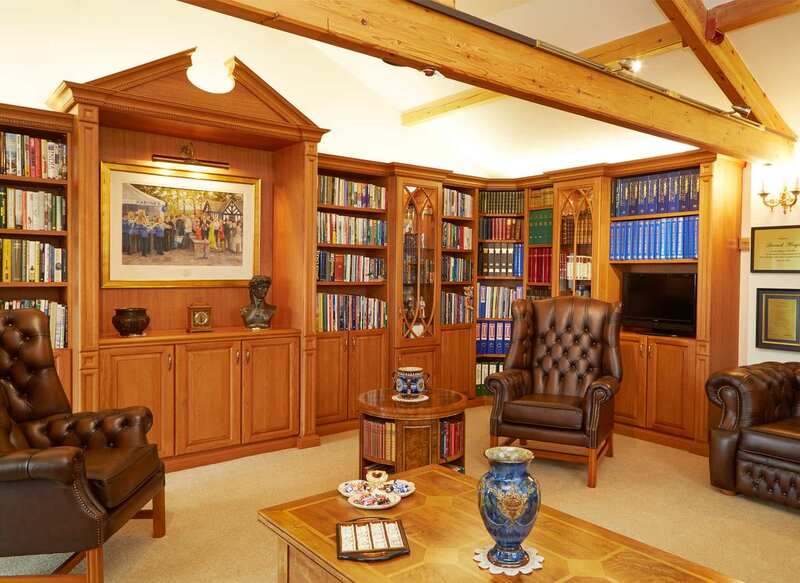 "The installation of my bespoke library is the fulfilment of a long held dream and it shows off my cherished collection of books and archive material to stunning effect. After house purchases, this project represented the largest single investment of my life, so there was some apprehension. 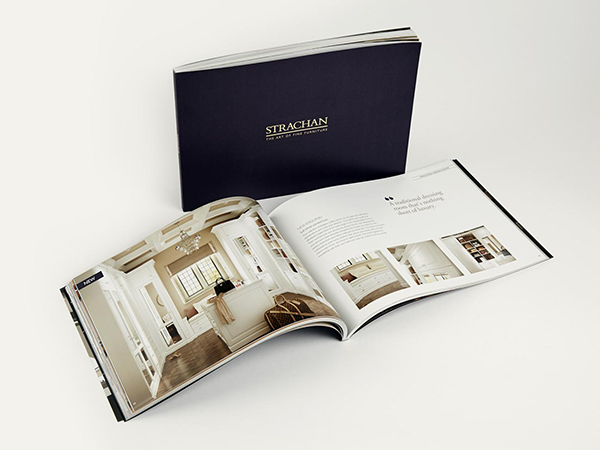 But the professionalism of the Strachan team throughout all phases - design, survey and installation - allayed my concerns. The result speaks volumes and, to modify a familiar maxim, the delight is in the detail. " 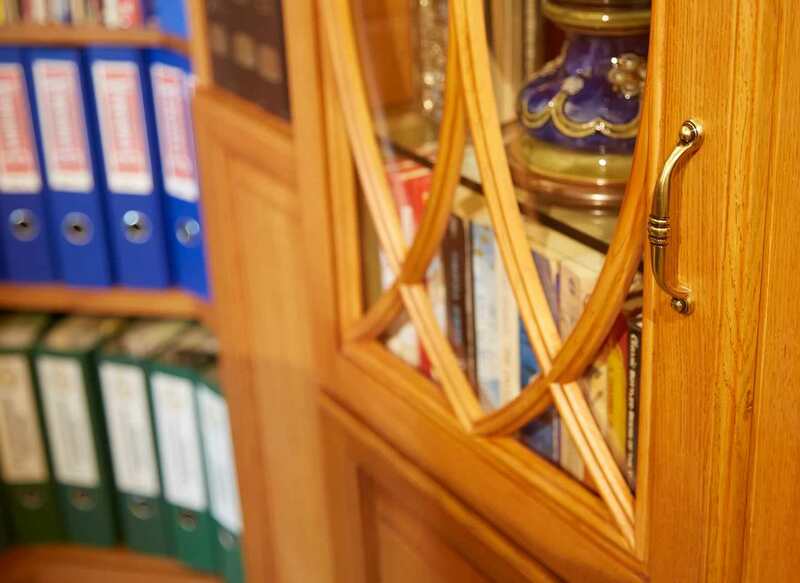 Another striking feature of the Shades of Oak range is the dramatic wardrobe pediments. David’s design consultant saw a fantastic opportunity here, with the exposed ceiling beams and roof apex being incorporated into the design. The pediment aligned perfectly with the structure of the ceiling, falling directly in between two ceiling beams for a symmetrically precise result. The shelving was essential to house David’s vast array of book titles. 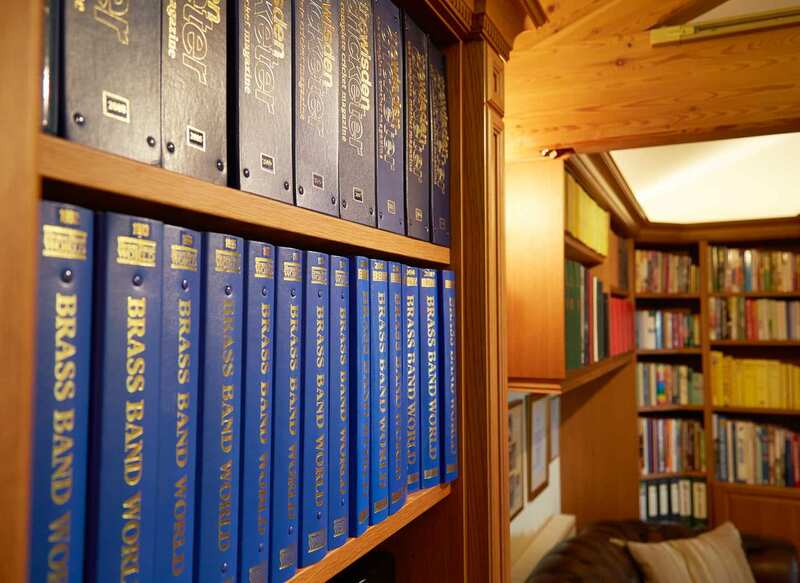 The units were measured to precisely accommodate his complete collections, beautifully surrounding his books from cover to cover. 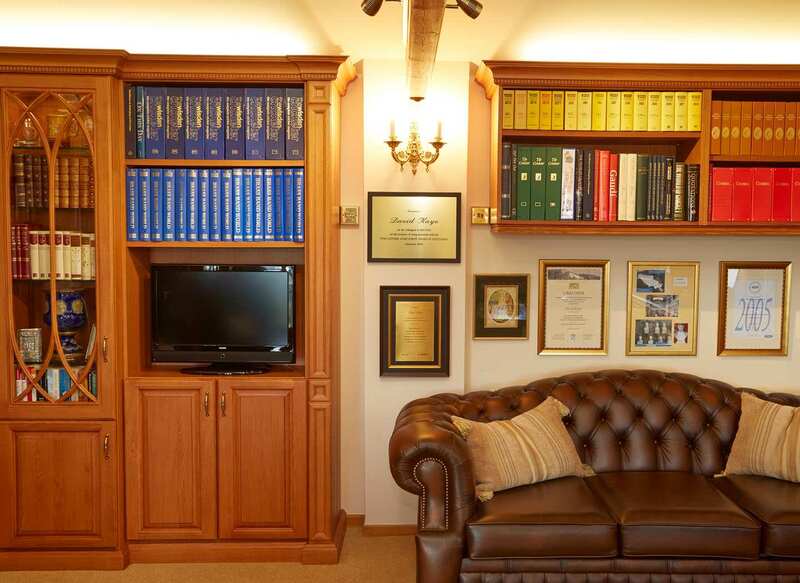 While the shelving was measured to the inch to accommodate all David’s books, Strachan ensured that ample wall space was left, providing an ideal place for him to display all of his awards and achievements. Another tailor made feature of the built in cupboards was the alcove, created specifically for Mr Kaye’s retirement commissioned painting. The space was measured exactly, to let the painting hang in an aesthetically pleasing space. The hardwood shelf below offers an area for select items, while dramatic lighting draws the eye to the treasured framed painting. As well as providing David’s desired understated base cupboards, glass fronted ones were also incorporated into the design. Complete with glass shelving and LED lighting, these gothic style cabinets were the ideal way to exhibit David’s collectables. Finally, a matching desk provided David with a dedicated workspace. 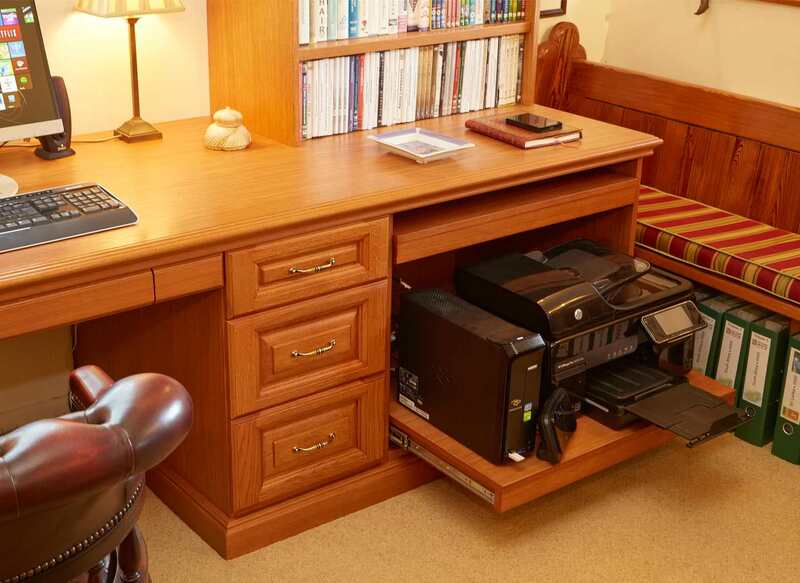 Cleverly integrated solutions, such as a pull out printer tray, were incorporated to offer storage space for all his technology, without interrupting the streamlined design of the library.